Many Palm/HP devices include a great web browsing experience and support the features and interface required by OnTime Mobile. OnTime Mobile Web offers an attractive and simple interface, designed to work well on full features web browsers. All essential information and functionality, including two way communication, is included. 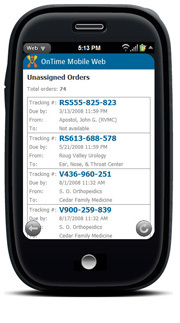 More sophisticated features of OnTime dispatch software, such as signature capture and GPS tracking, are included if the device supports them. From the Palm device, start the device's web browser. Enter the URL from step 1 into the address bar of the device's web browser. If your Palm device is connected to the internet properly, you should see a log in screen within a few seconds.